It was a good movie but not what I thought it would be. I wouldn't have watched had I known it would be so gruesome. Was no where near as good as Taken or Taken 2. Rented the movie from my Cable provider the other night & we were pleasantly surprised for sure. 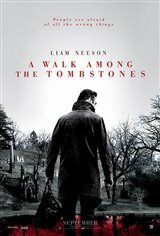 Liam Neeson does not disappoint as usual & the cast of the movie was equal to Liams performance with-out a doubt. The movie had you go up & down as far suspense & the viewer did not really have oh yah I know who or what happens.The movie takes you into the world of sicko's that get off of murder torture & pain. My wife & I did not mind spending the money on the movie as it was well worth the entertainment. I give the movie 4 out of five Stars **** I recommend the movie very entertaining indeed. Not 10 years old, just set in a time when the towers were still there. They've been added for continuity. A good movie over all, the kind of action you would expect from Mr Neeson. Good movie to watch. I liked it a lot. Great movie. Liam Neeson is absolutely wonderful. A total of 45 stars from 16 individuals gives this an average rating of 2.8. Not the best for a Liam Neeson movie. I am a fan but the slow and poor story line did not help. Maybe Taken 3 will be better!